Here at Newman Family Dentistry, we believe in taking a family approach to dentistry — largely in part because our staff is like one big family. 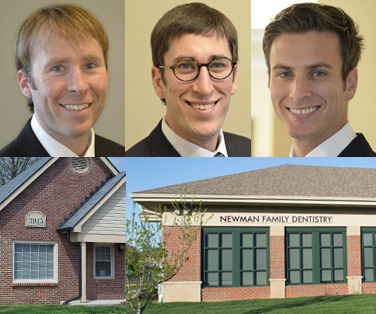 In fact, our family dentists, Dr. Marc Newman, Dr. Don Newman, and Dr. Mikel Newman are brothers who work hard to provide top-notch dental service to patients of all ages. In addition to offering excellent dental care and focusing on the patient experience, our office is tailored to accommodate the busy lives of families. Here is a little more information about the services we can offer your family, and how to make an appointment with us today. If you are a new parent, we would love to walk you through the early care of your child’s gums and erupting teeth. In addition to providing you with valuable information about taking care of your child’s teeth and gums, we can also prescribe fluoride supplements to make sure that those first teeth grow in strong and healthy. We also provide gentle frenectomy to make sure your baby's mouth is developing correctly. Our friendly staff will always work hard to make your children feel at ease in our office. We focus heavily on preventive care for children, offering in-depth dental cleanings, sealants, and gentle restorations. Our dentists will also carefully check for and track ongoing dental problems, so that they can address oral hygiene issues and instruct and encourage them to begin good habits that will keep their teeth and gums healthy for life. By focusing on proper dental health early, your child can have a healthy, comfortable smile that they are proud to call their own. As kids approach adulthood, they are typically more concerned about the way that their teeth look. Our practice also offers orthodontic care for teens who might need braces, including the invisible Invisalign system. And as teens move into adulthood, we can help with wisdom teeth removal before they cause pain or health issues. In addition to screening adults carefully for oral health problems such as gum disease, oral cancers, and decay, we can also address cosmetic concerns like yellowed teeth or misshapen gums. We want to give you the smile of your dreams, which is why we offer teeth whitening, cosmetic tooth and gum reshaping, tooth-colored fillings, and even full smile makeovers. We also offer sleep apnea treatment mouth guards, which could help you to fend off symptoms without struggling with a bulky CPAP mask. Our office also offers a wide range of services to keep your smile attractive and healthy through a long, full life, including dental implants, denture care, and even gum disease treatment. Our dentists can give you a full smile makeover if you have several teeth with issues, or it has been awhile since you have been to the dentist. Make an appointment today to see how we can give you a smile that looks and functions as well as or better than any other time in your life. To make dental appointments as convenient as possible, our doctors split their time between two different offices — one in Carmel, and one in Indianapolis. We also offer a wide range of appointment times ranging from 7am to 7pm, making it easy for busy families to schedule early morning or evening appointments. If you're ready to schedule an appointment or have any questions, contact us today. If you are a new patient, you can even print off our new patient forms before your appointment to speed things up. Here at Newman Family Dentistry, our goal is to take the stress out of your family dental appointments.